Eye health and sight loss professionals make use of RNIB’s eye health telephone service that’s dedicated to providing information and advice about sight loss. A team of six RNIB eye health specialists with backgrounds in optometry, nursing and information provision, man a phone line between the hours of 9:30 and 16:30 Monday to Friday. Matthew Athey, Eye health information service manager, heads up the team. “We aim to provide the people who call us with a greater understanding of their eye condition, the available treatments on offer and help them to make decisions about their treatment,” he explained. The service provides high-quality eye health information that’s tailored to individual caller’s circumstances. Last year, the team, who have completed RNIB’s four-day Eye Clinic Support Studies course which is accredited by City University London and who also have extensive training in communication skills, helped over 2750 people (April 2015 – March 2016). On a regular basis, the team speak to people with common eye conditions and their friends and family. The team also hear from medical, social care and education professionals who use the phone line to find out information about eye conditions, treatments and to ask questions about their patients which they may not know the answer to. As well as having expertise on common conditions, the team has developed a wide range of knowledge for rarer eye conditions like Microphthalmia, Birdshot uveitis and Bardet-Biedl syndrome. Athey explained this understanding has come about because of the number of different cases they hear about on a day to day basis. The team can’t diagnose or be prescriptive with what people should or shouldn’t do, but can offer the general information people can use to help make their decisions. “Often we encourage people to have further discussions with their medical team and formulate questions with them that may help when speaking with their ophthalmologist,” Athey explained. As well as manning the phones and managing a schedule of call back appointments, the eye health team also produce the information RNIB publishes on eye conditions. This includes the Understanding series, 10 information booklets written in conjunction with The Royal College of Ophthalmologists about conditions including AMD, cataract, diabetes, glaucoma, Charles Bonnet syndrome, retinal detachment, retinitis pigmentosa, nystagmus, posterior vitreous detachment and dry eye. All have the Information Standard quality mark. Athey and his team are always looking for new ways to provide callers with vital eye health information. The eye health web pages on RNIB’s site include videos featuring individuals talking about their eye condition, their treatment and how they cope with the changes to their vision. The eye health team phone line is open Monday to Friday from 9:30 to 16:30. To speak to a member of the team, call the RNIB Helpline on 0303 123 9999 and ask for the eye health team or email queries to [email protected]. Find out more information about eye conditions. The Understanding series can be ordered through the RNIB Helpline on 0303 123 9999. Information about rarer conditions is available online to read and print out if needed. 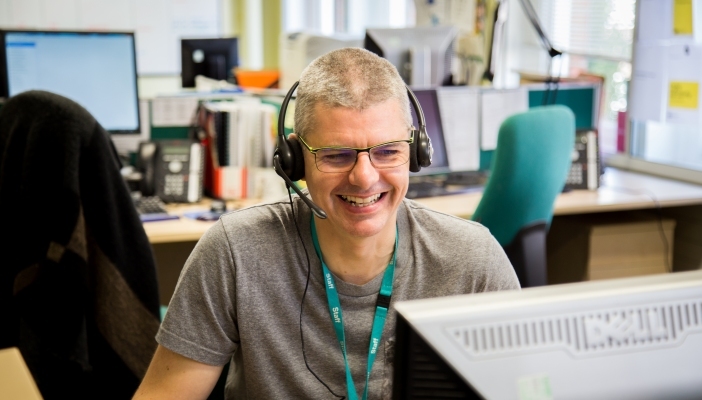 RNIB’s Helpline is the gateway to many other services including the Advice Service, Legal Rights Service, and the Sight Loss Counselling Team which professionals and blind and partially sighted people can call. To speak to one of the teams, please call the Helpline on 0303 123 9999 and ask for the service you'd like.